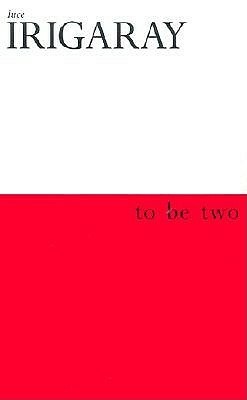 I’ve recently finished reading a book by Lucy Irigaray called To Be Two and it’s led me to deeply shift how I think about love. Well, truthfully, it’s not that I haven’t thought or embraced this kind of loving previously, but it’s been quite a eye opening exposé to exactly what it means to to love. You see, there is a primary difference between “I love you.” and “I love to you.” Grammatically, it’s ‘to’. (prep.) In a direction toward so as to reach: went to the city. (prep.) Towards: turned to me. (prep.) Reaching as far as: The ocean water was clear all the way to the bottom. Lacking ‘to’, though it may be dramatically omitted for a slogan’s sake, seems to implicitly mean that the act of loving is bi-directional. That is, without your love back towards me, without your commitment to me, I simply cannot exist in love with you. Lacking ‘to’ means possessive loving, not submitting or surrendering to love. Lacking ‘to’ means I must consume you and your love in order for love to work between us. Is this the ideal act of loving? Is this ideal love? Is this how we should love? Even the concept of ‘I am in love’ implies that we are somehow transported into this bubble of love that one cannot escape, that there is a clearly defined outside and inside of this love bubble that did not exist before and should be carefully preserved for it would be a shame to be ‘out of in love’, or at least ‘out of in love with you’. I definitely don’t think consuming another’s love is the sustainable, long lasting way to love. It doesn’t seem healthy, though I know very well it can be incredibly intoxicating. There are absolutely times when it is appropriate and maybe even necessary to consume another’s love. For example, in the midst of love making, there is a necessary consumption that is part of the give/take, that without can leave an empty space between lovers of not going the distance, not fully committing, and a feeling of not being held/caught. However, this is probably confusing to love with love making. Let’s entertain this thought for a minute. Since you’re super love-making extraordinaire, let’s say you make love for 2 hrs a day. Let’s also assume that you’re sleeping 8hr days. This leaves approximately 14 hours of opportunity to ‘love to’ someone or something. Digging into the thought of love in the singular perhaps hinges necessarily on how we do love, and further, what our culture and ancestors have handed down to us as a way of doing love. The very monogamist (and perhaps theist, though I’d be interested to see or read about any possible correlation between mono-theists and monogamy, and poly-theists and polygamy) modern marriage hinges upon the religious interpretation thereof, especially so in the western culture that I live within. It is hard to imagine a wedding without a priest or pastor to overlord (read: approve) the processions. My grandmother wouldn’t be too happy should she hear of one of her grandchildren committing to monogamist love without the approval of a religious fair sayer, regardless of the religion of said approving body… I digress. This commitment of marriage will (dangerously) usually mean that we close our ability to love another that is not our, even children that are not our we have a hard time to love. It is with this justification that being down right cold to another is performed for fear of breaking this sacred singular. How can we show somebody that is not our monogamous partner any hint of love, lest they should love me back?! Perhaps even the struggle between parent-child relationships is exasperated by this need for a mutual love with complete ignorance of what to love means. Imagine how much more easy rearing children would be if parents loved to their children first (meaning their children’s own choice to love back wasn’t implicit), followed far behind by transmission of a prescribed doctrine. However, this benefit of polyamory breaks down as we shift away from expecting to be filled by another’s love that is in mutual ‘in love’ with us. What even gives us the impression that another, any other, should fulfill some kind of love void that we harbour? This is like buying a cat to satisfy our hug quota each day, or the quest for the holy grail. When we are loving to, we are not left filling a void. Our void is filled by the loving we give to ourselves, and the love to others is what then overflows from there. In the process of loving to, I know we will magically find ourselves conscious of how we are loving almost everything we are loving to. This consciousness will then allow us to be more aware of the bits of love that are to us like lazer beams! This is not some sort of expectation of another. It is here where a plural of loving can exist, and should exist. How we walk through the world should emit love to the ground, to our limbs, to our expression, to those we walk past, to those who look at us, to those we hug, to those rays of sunlight that hit us, and those drops of rain that touch us. This is loving ‘to’. Perhaps this leads to the question of if we are always loving to, then how on earth can we fill up our own love void. Well, if you brush your teeth with such love and attention, could perhaps that spill into your own heart? If we prepare food with such love that we actually then sit down and eat it, will this fill us? If we care for our bodies with such tender touching and love, can we not physically massage love into our bodies? As hard as it may be to admit, I believe this love to ourselves cannot and should not be the exclusive love that we receive as sentient beings. Immediately the consciousness of chakras comes to mind, those micro vortexes of each being that interact with other micro vortexes to create alchemy. Have you ever walked through a garden and immediately been transformed into a higher vibration? What about into a church? Have you ever walked into a friends house and felt a warming that temperature doesn’t describe? Or knocked on a door that coldness and void consumes? Have you ever hugged another human and felt immediate magic? Each of these experiences are receiving shipments of love. Love to. Without these little gifts of love, the meaning and truth of life would be drastically different I’m afraid. We would receive no feeling from anything except ourselves, leaving fertile ground for sterility. I cannot think of one interaction that I have on the regular is rattled with a lack of love to. Seriously, everybody and everything smiles at you. Where is the Magic, Romance? But what then becomes of romance? Of partnership? Well, romantic love needs a special kind of magic! Of course. It takes two to do this romantic dance, which means magical love that creates alchemy and transcendence occurs when I am loving to you and you are loving to me, and we want to deeply consume this consciously by a definition that cannot be emulated or repeated. Should it mean that you cannot love to another that is not this partner in magic? Perhaps it means that I love only to you right now and for now in this deeply emotional and connecting way. It most certainly means that I will love to you right now as much as my existence can, as opposed to I will wait and see how much you love to me and I will then see if I’m interested in matching. I do know this magical dance doesn’t necessarily imply exclusivity, the exclusivity must be discussed between the two alchemic partners … but this is a whole other can of delicious cookies I will not dig in to today. Therefore, I shall love to you. I shall expect only that you are an existence that is capable to be loved. I will not resist in my loving to you because of any expected returns, a ROI. I will watch for moments that I can love to you, and I will remind myself of methods I can love to you that make sense to me, that align with me. I will keep my eyes open to identify and recognize and appreciate if and when you show signs of love to me, and express my gratitude to your heartbeat that maybe even just for one beat has been spent in my direction. All of the wise people of the village had gathered and were discussing why the sun was no longer shining so brightly. There was much arguing and accusations. The horse people felt it was because the horses were in the wrong pasture, while the hunters were saying it was because we didn’t sacrifice enough deer to the sun gods. The woodsmen were pointing fingers at the gardeners saying it was because the gardeners keep pulling up all the plants and planting their own varieties, and the boat people were saying that the fisherman had frequented their fishing hole too many times and left it in bad repair. Finally, after all of the fingers had been pointed, one old man stood up and introduced himself as a stranger. The stranger said he had had a vision that told him if he was able to find the right capstone on the banks of the lake, and the people of the village were able to show the capstone the love that it’s worship deserved, the sun would directly be increased in it’s power. At first, the gardeners said how silly this was, no stone could have that power. The fisherman said they didn’t need the strangers help to find a rock, and the woodsmen said it shouldn’t be a rock, it should be a tree. Finally, after all of the dismissals were made, the stranger stood up again and asked calmly if in the meantime, while the village was trying to figure out what to do with the problem of the sun, if he could propose that the capstone that he then held in his hand be a source or worship ritual for the village. He proposed that every day as people walked by the capstone they would send it love, positive thoughts, anything that one would normally shower their partner or children with. To this, the boat people said they had enough stones to get mad about scraping up their boats, the hunter said the only thing stones were good for is warming the beds in the night, the gardeners grumbled about how much the stones in their garden beds made their life a misery, and the horse people said that stones were only good for chicken’s gullets. Finally, after everybody voiced why they didn’t like stones, the stranger stood up and said nothing but just smiled holding the stone for all to see as if it was as precious to him as a newborn baby. Slowly, one by one, the people around him began to smile, and the whispers began to inquire about how much it could really hurt to give it a try.